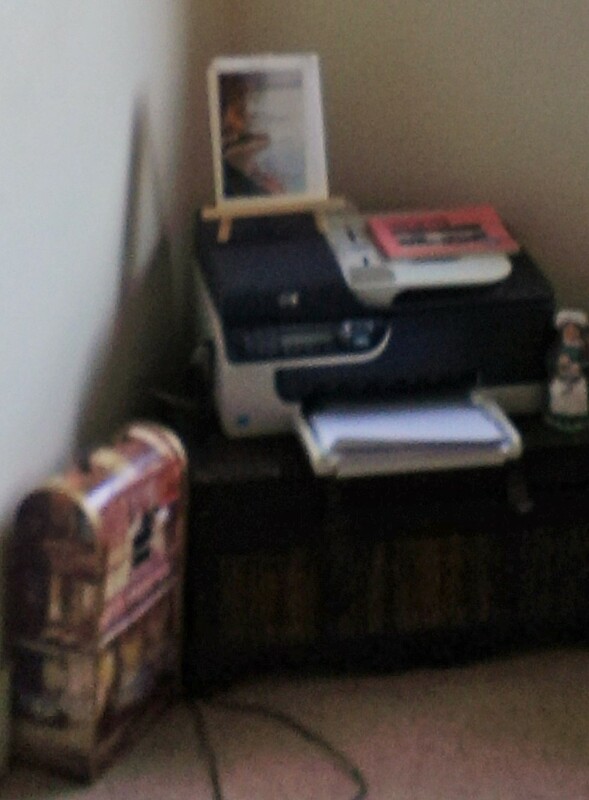 That blurry picture up there is what I now have in the corner of my wee living room in place of the TV stand and small, old and non-digital TV. I haven’t used the TV in the past two months since I cut off cable for the first time in my life, ever. I can get most shows that I want on Netflix and from websites but I do somehow miss the general noise of it all. Almost half a century of TV is an interesting thing to give up, especially living alone. I schlepped the TV, stand et al to my storage locker in the basement – I am not quite ready to give it up completely yet. The Glenda, who I had a Costco hotdog with today, noted that if I get a TV again it can be a nice digital one that hangs on the wall. Indeed. That would be the next step but not for while I imagine, as I am still in money not spending mode, except for an odd and quick idea I had to go to Hawaii in January because tickets there are bizarrely cheap at the moment. Thought my sister might want to come but then I realized that from Ottawa that trip is a whole lot more expensive. And I looked into hotels and the like and alas, not. So while that may seem like a tiny change, for me it is a rather huge change this no TV in the apartment thing. But I continue to be about less chaos in the small abode and more calm. I made another what was for me huge decision yesterday, one that had been coming for quite some time. An end of a kind of relationship of a sort, one that I won’t go into mainly because it is hard to explain. It wasn’t with S.T., phew, but perhaps someone rather similar. It was an abrupt ending per my decision because I cannot in my big feeling way deal with a drawn out (or even non-drawn out) goodbye. Tear off the band-aid and move along is how I need to do it. I learned a lot and got a lot out of the situation but let it drag on probably about six months too long. As one can do. I think my emotions around this will be tender for awhile and it makes me sad deep in the corners of the heart areas, but not in an explainable way. So, an ending. The season is of course changing to fall – some kind of equinox tonight – and the air is full of fall. Leaves changing colours, cooler weather; Kitsilano Pool closed for the season. Putting away my shorts (well, by November surely) and knowing I need to buy new pants, tops, and the like. I loved this summer – lots of hot weather and a tan that made me look healthy and wee shoulder muscles built up from Kitsilano Pooling it a lot and I also cycled almost everywhere all of the time. I have various pictures of Vancouver’s water all over my bedroom which I think may help during the long cloudy/rainy season. I have begun tutoring on a semi-regular (for now), part-time basis some high school students referred to me from the Chinese cram school. That has and is a learning curve as I have never taught anyone this young before – two 13 year olds and a 15 year old. I am learning their ways and what they know and think, how the world looks to them at those ages. They don’t really want the school after school but they do as their parents want of course. I visit the 13 year old twins in their home and the 15 year old I have been tutoring at the downtown library. I’m not tutoring this week due to the 13 year olds being off at Grade 8 camp and my having some pre-arranged IELTS marking training on Friday evening (four hours, unpaid and I have to pass a test in order to be a marker, eeek). But having those students has given me a small amount of a schedule for now. And I will be starting to teach a Tuesday evening class at Langara next week; the Thursday evening one may not run due to low student enrollment. So with all of this work put together, I make less than I need but more than nothing. So that is a good change really. I am all ready exercising less – something I hope to remedy by signing up with the local recreation centre – it’s not the same intensity of workout as I get from outdoors but it is something. I want to actually consistently do (small) amounts of weight training so that I can fight off further aging forever. Something like that. So maybe that is a bit of a beginning too. Maybe I’ll blog more regularly.